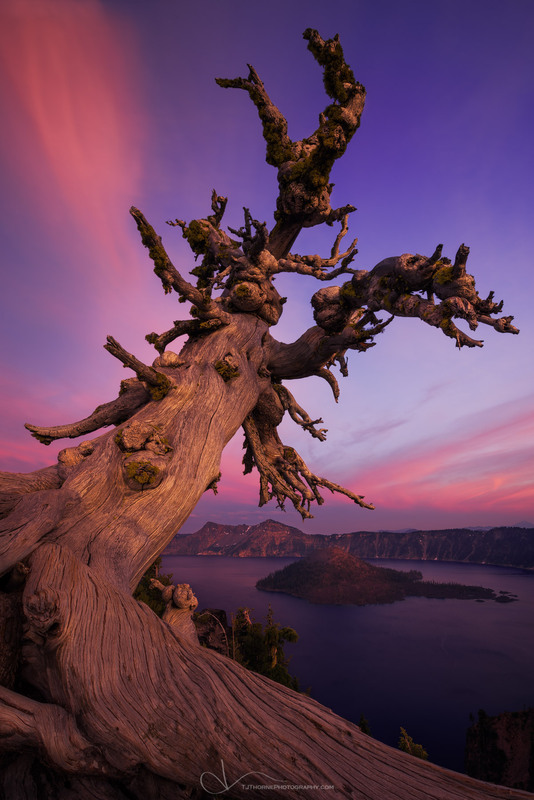 A whitebark pine overlooks Wizard Island and Crater Lake at sunset in Crater Lake National Park, Oregon. I spent a weekend at Crater Lake National Park showing some images in an art show and doing some preliminary legwork for my pending Artist-in-Residency in October of 2014. I'm very excited to spend two weeks at the park exploring the nooks and crannies and totally immersing myself in nature. I've never spent that much time out with no agenda and no distractions, let alone in a single place. I feel very fortunate to receive the appointment as only four people per year are awarded with the opportunity. This was also the first multi-day nature outing I had taken with my son Elliott... who was six years old. His patience and good behavior with sitting at the art show from 10am-5pm and then waiting around for sunsets, hiking, and my 'photography rules' (Don't touch that!, Stand over there!, Don't kick up dirt!, Stay away from the camera!, etc..) astounded me. I won't lie.. there was a hefty amount of "How much longer?" and "Can we gooooooo?" but overall this kid handled himself very well. I won't force it on him... but my hope is that someday he will grow to value nature the way that I do... that his interest in the art of photography continues to blossom... and that he will look back on these moments that we spend with appreciation, gratitude, and a desire for more. This one is for you, buddy. I love you. Thanks for letting me be your dad.